Terry Richardson knows a thing or two about building an offense around a running back. Five times in Richardson's final nine seasons in his first stint as UConn's running backs coach the Huskies had at least one 1,000-yard rusher nearly matching the program's total in the previous 46 seasons. Seven of the top nine single-season rushing totals at UConn happened under Richardson's watch led by future NFL backs Donald Brown and Jordan Todman. 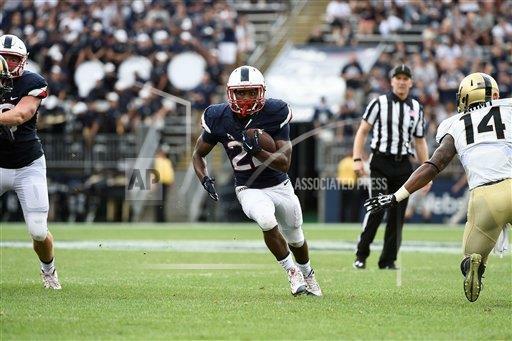 Now he gets to work with former Ansonia High star Arkeel Newsome who is 263 yards shy of breaking into the top 10 on UConn's career rushing list. "He is a very good football player, he shows a lot of versatility and toughness," Richardson said. "I think we can get some things done with him and he can be productive." So how does he compare to players like Brown and Todman? "He is not as big as those guys but other than that in terms of toughness, skill set and playing the game like it is supposed to be played, I think he has that," Richardson said. "There are those areas where he can make improvements and that is where I come in as a coach - (being) a good football player in terms of the little things, footwork, pass protection, play-action fakes and just the little things, the attention to detail, snap your route off, don't back into your route. Nothing major but just the small things that lead to major things being better." Richardson will also get to work a pair of talented youngsters Nate Hopkins, Ja'Kevious Vickers who redshirted a season ago. "They have to grow up a little faster," Richardson said. "Freshman year is over, they have to fight that comfort zone and just be more confident and assertive because you are not redshirting now, you are live bait for the games. My philosophy as a coach is I want to have everybody in my room game ready because you never know, injuries happen, things happen in a football game where you never know if you are going to play. We had a season here where we had one guy run for 2,000 yards, we had two guys run for 1,000 yards and we had three guys run for 800. The three guys who ran for 800, it was based on an injury type deals so you have to be ready to play whoever, however and how many at any given." Richardson spent the 2011 and 2012 seasons coaching running backs at Miami mentoring Lamar Miller, Duke Johnson and Mike James who have combined to rush for more than 5,000 yards in the NFL before stops with the NFL's Jacksonville Jaguars and at Maryland. After a year out of football, he received a call from Randy Edsall, who hired him at UConn and Maryland. "I wouldn't say that I expected it because you never know but I was very excited and relieved because last year was a situation that in my 18 years coaching, last year I sat out of football and I was looking to get back in," Richardson said. "I was really happy because of how I feel about him knowing him for so long and having the opportunity to work with him again, just knowing that I was coming back here to a very familiar situation. If you are looking for a job, you get a job and it is a place you worked at for 12 years in comparison to just going to a place where there is no familiarity, that was what I was excited about." Things are much different this time around. Back in 1998 the Huskies were playing at the I-AA level getting ready to move up in class. This time the Huskies are trying to rediscover some of the magic of the Edsall coached teams which posted six winning seasons and played in five bowl games in a span of eight seasons. UConn has posted six losing seasons since Edsall's departure after the 2011 Fiesta Bowl. There will be also a change in schemes with new offensive coordinator Rhett Lashlee's no-huddle offense. "In my career we were huddling and then the transition of it was Joe Moorhead bringing in his no-huddle philosophy and the guys were excited. We took it, ran with it and had success. I see the same thing, I think the kids are going to love it." This is the first time Richardson is working with Lashlee and offensive line coach J.B. Grimes but it hasn't taken long for chemistry to be formed. "There are no better people," Richardson said. "Rhett is awesome, very smart, a good family man, funny personality. He keeps things loose, keeps the meeting room live. J.B., a lot of wisdom, a lot of experience so it is going to be a fun season."